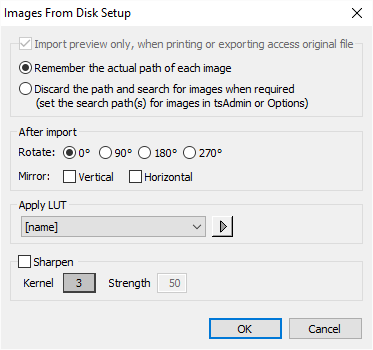 If when importing images into Images Mode the 'Remember Path' option is checked in the Images Import Setup Window tsPortal will be able to find the original images and display a thumbnail of them. Many users save their images in a folder whose name is the same as the jobname. A job called SpringfieldHS2015 could have images stored in a folder of the same name for example. Likewise a very popular method is for the images to be saved in a 'jobname#images' folder since this is also the format used by CapturePost. In the current example the folder would be called SpringfieldHS2015#images. In both these circumstances tsPortal can be directed to the parent directory containing these sub folders. The path is entered in tsPortal's Preferences window (Edit>Preferences). The screen gran below shows the parent images path entered as X:\Timestone\Images. 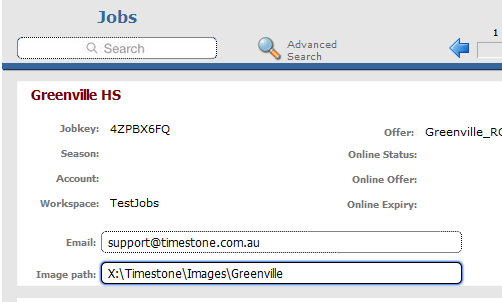 tsPortal portal will then search this location for sub folders called jobname or jobname#images. For situations not covered by the methods described above, it is possible to set a direct path to the images on a job by job basis. This path is set in the Jobs Mode window.